ArmorPoxy Floors for Government, Military, Fire & EMS, Police, Public Transportation and Municipal use. ArmorPoxy floors are superior for use in all types of government, military, public, transport, fire/ems and similar facilities. These types of floors have demanding usage with the need for long-term life and low maintenance costs over their lifetime. ArmorPoxy coating systems will last 5-10x longer than regular floor paints, eliminating the need for regular repainting. ArmorPoxy offers a wide variety of industrial floor coatings to fit virtually any application floor type. Traditional home-center type floor paints cure at approximately 3 mils thick. A sheet of copy paper is approximately 4 mils thick. ArmorPoxy’s industrial coating systems range from 7-250 mils thick and we can specify virtually any coating system to fit your particular requirements, and budget. 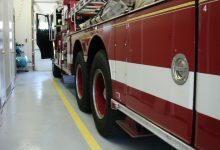 ArmorPoxy specializes in floors for any type of flooring for use on firehouse floors, ambulance floors, police station and prison and correctional facility floors, military bases, Coast Guard facility floors, water treatment plant floors, DPW floors, train stations, airports, bus terminal floors, hangars and helicopter pads. ArmorPoxy floors are regularly specified for large military bases and facilities. Recent projects include Tobyhanna Army Depot in Pennsylvania, and multiple hangar facilities in Iraq, and US Coast Guard, totaling hundreds of thousands of square feet. Our Job on Pallet Kits make installation easy and fast with no special skills required, and our Technical Services Department can make up any special package for any application. From easy to apply Armorpoxy II 2-layer coating systems up to our full broadcast ArmorQuartz floors, we can design any floor for any application. Heavy duty aggregate broadcast floors our ArmorUltra FH Series are available that exhibit superior thickness and abrasion resistance. ArmorUltra FH floors are built up from multiple coats of epoxy and aggregate, encapsulated and then top coated for the ultimate in protection. Below is an example of our heavy tonnage capacity FH Series broadcast floor being applied. Our FH Series floor uses a multi-layer epoxy build and encapsulated sand broadcast for a super thick, heavy duty floor. After this sand layer is applied ‘to rejection’, the excess sand is removed once the epoxy is cured. Then two additional coating layers are applied to encapsulate and protect the floor. ArmorPoxy floors are ideal for salt storage facilities, DPW road shops and similar municipal, and state facility operations. Our coating systems protect and add significant years of life to these floors, reducing maintenance costs, increasing light reflectivity, and creating a cleaner, safer, and more productive work environment. ArmorPoxy’s Armor-Tuff Firehouse and EMS Floor Division specializes in specifying and installing our SupraTile Interlocking floor tiles for these types of facilities. SupraTile floors are ideal where limited downtime is an issue, and a limited lifetime warranty is desired.